Seasonal decorating is a great way to freshen up the look of your home by changing the decor. This is also a refreshing way to improve your home and garden. Seasonal decorating does not have to be expensive. You can collect and store the seasonal decorations over the years and keep reusing them and adding to the collection. Keep in mind that alot of seasonal decorations are sold at clearance prices at or near the end of the season. So if you have ample storage room you can save money by buying your seasonal decorations late in the season and using the items when the required season rolls around again. Some seasonal items are interchangeable such as some spring and summer items, and time flies. It does not take long before you will be ready to use your decorations again! Keep everything organized and labeled so you know what you have. (UPDATE) One place to keep your seasonal decorating items out of your way is to add access to your attic and gain the attic storage space Just make sure that you have it properly vented and use an exhaust fan so you won't have damage from heat. We recently added a better access to our attic and I love the space I have gained in my closets by moving the seasonal items to the attic. Storage containers with lids will keep you decorations clean. Use different colored storage containers for the seasons to help you identify what you are looking for when you need to find your decorations. Clear containers are also good. But as an example, spring could be a pastel color, summer an Americana color of red or blue. Seasonal decorations for fall could be orange or brown, and winter could be white or red or green for the holidays. These are just suggestions. Use the method that works best for your seasonal decorations. If you already have storage containers put big labels on them that can be changed if needed. That is better than writing directly on the plastic container. Labels can be peeled off later. Store your season decorating items in areas that the heat and cold won't effect them. Most decorative items will be ok, but anything made out of styrofoam will crack with the extreme temperature changes. Hot glue will melt in extreme heat and so will candles. Only keep seasonal decorating items that you enjoy displaying. Get rid of ragged, damaged or unwanted decorations so they don't take up valuable space. The time to toss unwanted items is when you are packing them up. Sell them in garage sells, or on craigslist, ( to make money for items you do want). Or donate them to goodwill, or some other charity in your area. If you want to do seasonal decorating for spring, summer, fall and winter, take a look outside for inspiration. You don't need to change your entire house, just focus on a few rooms that are used by everyone in the household, such as the living room, bathroom or kitchen/dining room. As your seasonal decorating collections grow you can decorate more areas, including your front yard, and porch. Or if you prefer to decorate only on the outside then just do that. Focus on the areas you enjoy most. Remember it only takes a few seasonal decorations to make a big difference. Don't over do it and make it tacky. Especially your outside areas, to much of a good thing, is overkill. The exceptions would be if you enjoy decorating for Halloween and Christmas, lots of lights are fine, and the creepier the better for Halloween. Just don't go buy to many blowup decorations and have them on display. Less is more there. Refer to the following seasonal decorating ideas for inspiration for you own home. Remember have fun decorating and use your imagination. Always decorate responsibly, keeping your families budget in mind when you shop. Customize store bought items so your decorations will be uniquely yours even if you purchased it at a popular store. Add ribbons, fabric, paint etc to make your items unique. When decorating inside you will notice that alot of these tips are great for changing several rooms by using the items you take out of one space and reusing it in another room. This method is a money saver and really works well when colors are complimentary in lots of areas. Since there are 4 seasons each year, and within each season there are various holidays, LET'S START WITH SPRING. 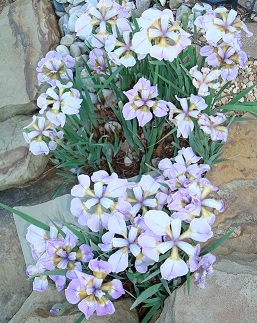 The Iris flowers pictured above bloom in my backyard in May each year. Spring time is the time of year we cannot wait to get outside and plant something. So plant lots flowers that will put on a colorful show outdoors when in bloom. 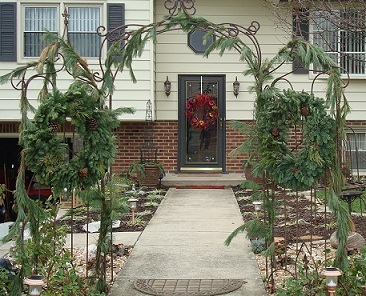 Use seasonal decorations your porch such as potted plants and hanging baskets. As the flowers start blooming being some cut flowers indoors. Bulbs planted in the fall ( the previous year) will add a beautiful spot of pastel color to your springtime landscaping. Buy live spring flowers such as tulips, or daffodils in planters and display thru the blooming season, then plant them in the ground for return visits for years. That way you are getting more value from the plants. You will have the same seasonal decorating each year, yet you only purchased the plants once. Take time to smell the roses - if you have any roses growing in your landscaping. If you don't then consider buying fragrant rose bushes or climbers. Alot of varieties provide a beautiful blooming show in late spring. If you don't like real flowers, artificial flowers can add a fresh look in springtime on your porch or inside. (never out in the landscape). Hang a wreath or wall pocket with artificial flowers on your front door. Make it yourself for a totally custom seasonal decoration. Make a living wreath out of live flowers for your door. Hand a windchime on your porch or on a shephards hook in your landscape for a relaxing sound. Some of these suggestions work great while doing your spring cleaning. A clean house is a great reason to redecorate for the season. Shop at the link above at rug doctor for everything you need to clean your house. Lighten up with lighter colored area rugs and throw pillows. Take your usual rugs and pillows to another room, such as the den, or bedroom and bring a lighter color in for springtime. Let the light shine in after a long cold winter. Add a touch of spring with garden style decorating. To do this, decorate the room with floral print window treatments, such as valances and light colored blinds. Take the heavy drapes down and use them in another room (this is also a good opportunity to get them cleaned). Floral pillows are also a nice touch for a garden style look. Pretty gardening books look great displayed on tables or shelves. Fresh new candles, and room sprays are delightful in floral scents. Provide fresh new pastel colored towels and bed linens in bathrooms and bedrooms. Put flannel bedsheets and heavy blankets away until winter. Store your heavy throw blankets, display lighter weight ones instead. When weather permits, open the windows, enjoy the fresh air, feel the breeze and hear the birds sing. Change the furniture around, enjoy the view from a favorite window, looking out into your garden. Decorate tables with cut flowers or better yet -Bring in fresh cut flowers from your garden. Seasonal decorating with Easter decorations can be fun, especially if you have small children in the family. Make sure to remove the holiday decorations after Easter, but continue using your spring decorations longer. Decorate with Americana Decor for Memorial Day, Use red white and blue decorations. These items can also be reused in the summer season. The room will be ready for guests and the colors will be welcoming. In our home we have a small extra bedroom that is only used by guests a few times a year. The paint colors were chosen when the room was occasionally used by our teenage daughter. It was one of the first home improvement projects my husband and I did when we got together. Now the room has totally evolved into what I call the springtime bedroom room. The room has a large window. So plenty of sunlight flows through when the blinds are opened. The window treatments are vertical blinds to control the light and sheer swag toppers in lavender. The drapes are purple. Sometimes for a lighter look I take the drapes down and just use the topper and blinds. The walls are painted vanilla bean (cream) up to the chair rail moulding. Above the moulding the wall are painted apple green. All trim is vanilla bean, including doors and baseboards. Carpet color is taupe. We re carpeted all the bedrooms in the same color. The furniture is antique, painted a distressed ivory with subtle accent colors in the painted pastel flowers in light blue, pale green and yellow. It is primarily ivory and pale yellow. I inherited this gorgeous antique bedroom furniture from my grandmother. I got the furniture after the bedroom had already been painted. It is amazing how everything came together perfectly. Its like the room was waiting for the perfect furniture. As I have said before everything happens for a reason. For the bed, I have a pale yellow quilted comforter with a ivory bed skirt. I use lots of pillows on the bed. 4 of the pillows are solid purple and 4 are a quilted floral pattern on a pale yellow background. Buy Your Next Comforter at TotalBedroom.com - Free Shipping! (The floral pillows were purchased separately from the comforter.) I also have an area rug with ivory and purple and green floral pattern. A few years ago I made a spring bouquet as a seasonal decoration in a wall pocket for the front entrance door to the house. During other seasons I hang the wall pocket in this bedroom. It works great. The colors are the same as the other florals used in the room. We have rounded corner shelves on the walls that are painted apple green. The look is very custom. I have rag dolls and bears on these shelves. I have silk flowers in vases. A wicker trunk at the foot of the bed has a floral motif on the front of it. I have 3 stacking wicker boxes that match the trunk. The only items that were purchased for the room was the comforter and floral pillows, and window topper. All others were items we already had. Some decorative items are up to 13 years old. You can use old decorative items you already have in use, in other rooms (or even from a previous home) in new rooms. By doing so you save money and the old item seems new again. I love this bedroom. I keep the door closed most of the time to keep it clean and fresh. We have pets and I want the space pet free for guests. Now no matter what time of year it is, when I go inside the bedroom, I always think of spring, and my grandmother. Have fun with your seasonal decorating and use items you love. 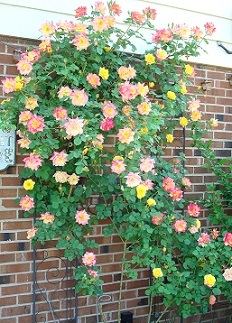 The climbing rose pictured blooms most of the late spring and summer. I have it growing on my back patio. It is my most colorful rose. Take the houseplants outside that are able to withstand outdoor elements. Summer and Spring seasonal decorating ideas are similiar. As it heats up outside you will want to be comfortable. Put all of your blankets away. Place fans in areas that need better air flow. Ceiling fans are wonderful to help circulate the air. 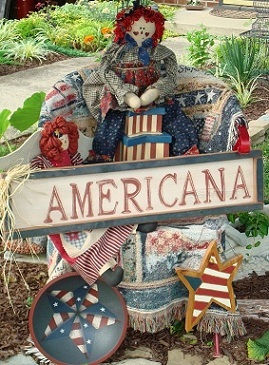 Decorate for Independence Day and Labor Day with red white and blue accents in flowers, table decor, and collectibles. Hang an American flag on a flag stand outside. Americana items can be left out all year if you happen to enjoy them. I recommend doing a theme room and displaying them there. Only use nice decorative pieces - nothing like party items. Unless you are having a party or event. Examples include Americana rag dolls, raggedy Ann and Andy dolls trunks, baskets, throws, pillows, wood crafts, Antiqued items add a country flare to the decor. Bring in cut flowers from your garden. Add some bright colors such as yellow, turquoise or lime greens in accent pillows candles and accessories. Bring in cut sunflowers from you garden for a big splash of bright color. My favorite time of year is Fall!!! I always have a great time using fall seasonal decorations. Autumn colors are so vibrant. I Love it when there is a slight chill in the air. My favorite holiday for decorating is Halloween. Click on the link above for Halloween decorating ideas. Keep using natural items for a wonderful look. Take advantage of the cooler weather and spend some time outside with a firepit in your backyard. 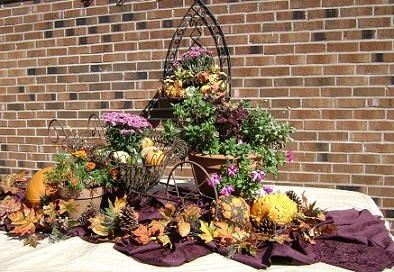 Plant hardy mums through out your landscaping for added color in your fall seasonal decorating. Mums are available in yellows, purples, deep reds, white, orange and bronze. Use no more than 3 colors at once for the best look. Buy perennials so they return again next year. This is a better value and mums are pretty even before they bloom. Visit a local farm that sells pumpkins and gourds. Products are much fresher and stay usable longer. You can pick up more in big box stores if you have to later when the weather is colder. It is also alot more fun picking out what you want from the huge displays at the farms. Make a day out of it and include the family. We visit a local orchard, Evans Apple Orchard, each fall and take the dogs with us. It really is fun. They have a country store that sells food items too. Take pictures for memories and decorating ideas. Some places offer hay rides, apple picking, and animal petting events. Check your local area for events. Display these items from mid September thru Thanksgiving. Display them in pots, on steps, in wagons, baskets and in your landscaping. This really adds color through out the season. If you decorate for Halloween, draw faces with black permanent markers on the pumpkins then turn them around to keep using them thru Thanksgiving. Place 3 fodder shocks (corn stalks) together tied together with fall ribbon or heavy jute string in a display with bales of straw among your flowers, pumpkins and gourds. Add a scarecrow for fun. Have it standing or setting on the bales of straw. 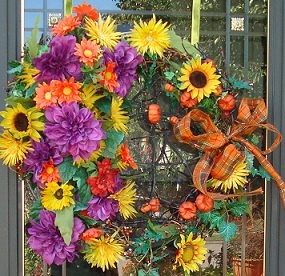 Place a fall wreath on your front door. Plant bulbs for Spring time blooms now. Decorating for Halloween can include anything fun to scary creatures. I will have a separate page on Halloween Decorating. I Love to decorate for Halloween so I have lots of Halloween decorating ideas. Check out a few pictures of fall decorations below. The picture above is a large red mum and Kale in one of my flower gardens a few years ago. 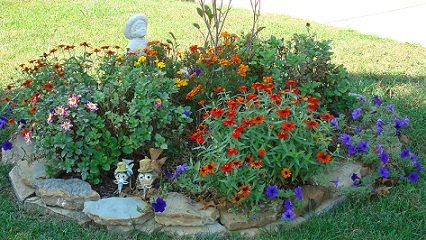 The photo above of orange zinnias and purple wave petunias around a young magnolia tree with other annuals. I save seeds from the zinnias each year. The orange and purple color combination is perfect for fall seasonal decorating. The birds add a whimsical touch, decorating should be fun! 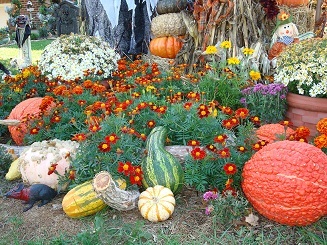 The next photo shows is a collection of flowers, pumpkins and gourds used during an outdoor event at our home. The pictures below are of the Free Garden area I made after removing the pine tree from the front yard. This display was made for fall. I removed the zinnias in the center to place the straw, and fodder shocks in the center. You can see some Halloween touches in the display..
Wrought Iron Decor here. The picture shows some fall and Halloween decorations,. 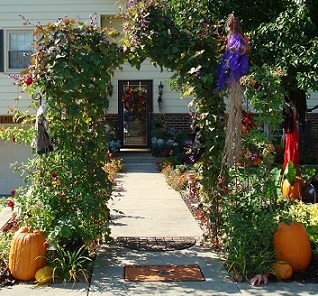 Shop for Halloween Decorations here the arbor has blaze climbing roses growing up it, and hyacinth bean vine flowers with purple blooms. This picture is from 2 years ago. The arbor is now completely covered with the climbing roses. If you have a fireplace do some seasonal decorating on the mantle. Use natural twigs and garlands placed on the mantle at the base of other accessories such as candle holders, or lanterns. See Photo at the left. 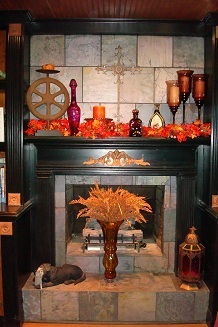 This is our fireplace decorated for fall with a garland and various accessories. You can keep it simple like this and use the decorations until Thanksgiving. 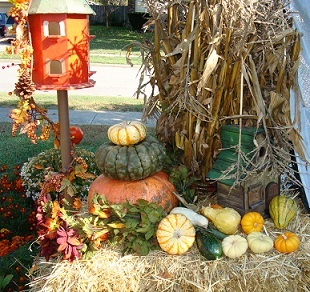 Add some real or artificial gourds and pumpkins for a touch of the fall harvest look. Check out the link above for fall decorating needs. Rotate your throws, put lighter ones away and bring out the cozy thicker ones. Drape them over your arm chairs, at the foot of beds, etc Darker accents are used again, store the pastels, and hot summer colors. Continue bringing in cut flowers or potted plants from the garden until frost. Replace your bed linens and towels with darker richer colors. Use you heavier throw pillows and area rugs. Bring in all houseplants before the weather turns to cold. Put your darker drapes and valences back up. Add natural colors with accents in reds, oranges, golds and browns in your seasonal decorating color scheme. Put away all summery items that don't fit in. Store these items in containers to reuse next year. Decorate with metal, iron and brass accents. If you decorate for Halloween use some Halloween decor near your front door for when guests arrive to trick or treat. See my other page on decorating for Halloween. Place serving pieces out on buffets or countertops with autumn leaves and pine cones around them. Stack a vase on a charger, surround the vase with leaves and twigs and pine cones placed on the charger. Add natural twigs in the vase with real or artificial flowers. Use cinnamon scented sprays for a great fall fragrance. Bring out fall potpourri for added fragrance. If you decorate for Christmas on the outside, place decorative lights on trees, and along you walk. Place a winter wreath on your front door. Like in the picture above. You can shop for Christmas Decorations here Add pine garland and berry's in planters with obelisks,Like in the picture above. (This picture was taken in January, after the holidays. Use Christmas decorations such as sleighs, placed on the porch or under a tree. As the winter season approaches surround yourself with all the comforts needed to stay warm and cozy. We don't get to spend as much time outdoors in winter so I will focus mainly on inside decoration here. Decorate with a Christmas tree, and pretty ornaments for the Christmas holiday. Add garlands and ornaments on mantles, shelves, centerpieces, stairway railings for added holiday decor. Add table lamps for better task lighting. Consider painting a room a darker color. Use common sense here, you would not want to have to paint the room over again soon. Arrange your furniture to face the fireplace. Winter time is a great time to focus on indoor projects to improve your home. Shop for holiday decorations at the link to home decorators collection below. They have everything you will need to decorate for the holidays. Get more Holiday Decorating Ideas here. Cozy up with the ones you love and stay warm, and plan on new your outdoor spring projects to improve your garden. Make sure to store all of your seasonal decorating items in a air tight place to keep bugs and dirt out. Use good storage containers for all items. 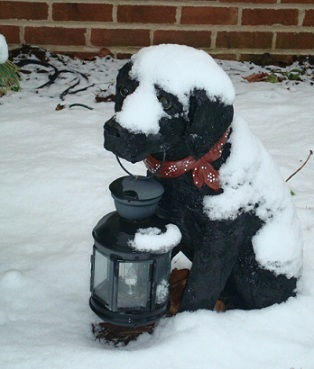 The Picture below is of a Labrador retreiver statue holding a lantern in its mouth. This is a friendly reminder at our walkway to shine a light on guests and to remind them that we have dogs. Feed the birds and squirrels during the winter months. This adds a nice touch to your winter seasonal decorating and helps feed the beautiful birds and squirrels when it is cold outside. They are alot of fun to watch on cold winter days. Have A Great Story About Seasonal Decorating? Do you have a great story about this? Share it! Do you decorate for the seasons,or the holdays? Describe your decor and share photos with us! I will publish your story on this website!